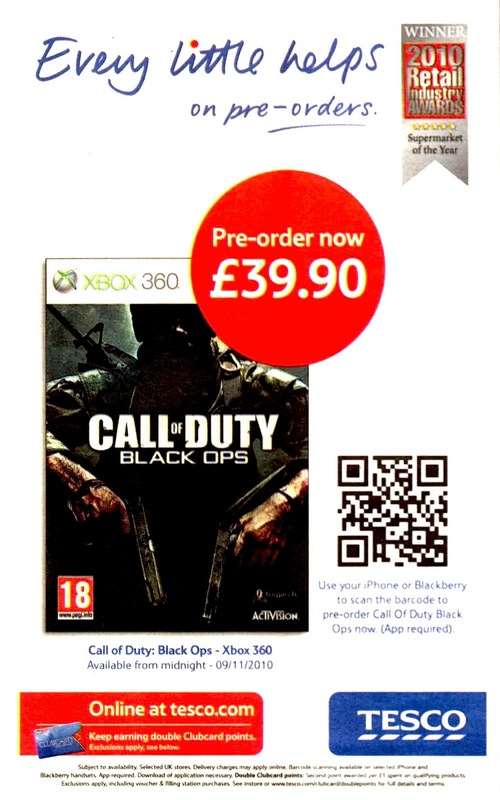 Mike Fethers, a buyer for Tesco Entertainment, has sent me Tesco's first QR-code enabled print advert! You should be able to scan the QR code on the image he sent me below (click image to show larger version if needed) using your smart-phone with a suitable barcode-scanning app. That page is a deep link into our Tesco Entertainment site that enables you buy the game direct from Tesco. It's great to see QR-codes make the light of day at Tesco! If you have been reading in the media about my proposal to have a form of in-store "satellite navigation"-style location based awareness for Tesco Finder app users, I thought I would take you on a dive into the sort of research we're doing to see if we can make this work. "As the customer, I wish to be guided to the product I am looking for in the store". "As the customer, I wish to be alerted by my phone whenever I am close to a product I have stored in my shopping list". "As the customer, I wish to be alerted by my phone whenever I am close to products on special offer that are similar to products in my shopping list". "As the customer, I want you to show me a map of the store layout, and on it show where both I am and where all the products in my shopping list are located". We know where all grocery products are in every UK Tesco branch as long as it is bigger than an Express-sized format. This data is already provided to Tesco Finder users. We are already obtaining good aisle and shelf location spatial data from software that is used by Tesco merchandising teams that creates planograms. We haven't made this live yet but it's looking good. 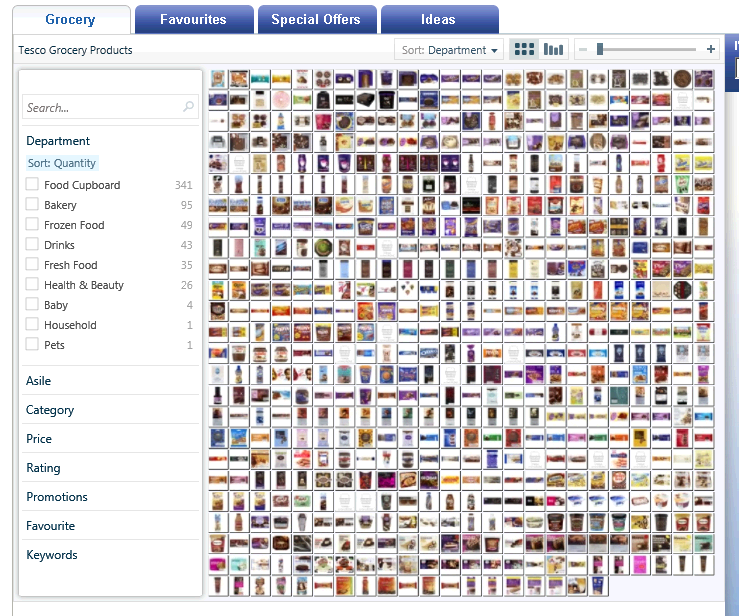 Tesco Finder would take this data and draw out all the aisles on the screen. We're making sure we describe the layout using as few characters of data as possible (I hope other app writers think as carefully about your data plan limit and keep the amount of data transferred down as much as all Tesco app authors do). So we know every product that every Tesco branch stocks, and where it is laid out spatially in that branch. We know what products are on special offer and what the nature of that offer is. We just need to update the Tesco API server interface to make the spatial/map data available in as few characters as we can, and code a version of Tesco Finder to support the store map. That work is in progress, and we have found everything we need to make it work. So "all" that is left now is to work out where the customer is, on a phone that loses the GPS signal as soon as they enter the Tesco branch. Hmmm...! As you can imagine, all of our Tesco stores have wifi wireless network access points built into various parts of the building. These provide staff with the ability to enjoy network connectivity from their various handheld devices as they go about their tasks, so this is a critically important part of our in-store infrastructure. Each access point has a unique identifier - a Media Access Control (MAC) address - which it supplies in every piece of signal data it transmits. We can tune into the wireless data chatter and read the MAC address without actually having to connect the phone to the access point. Indeed the phone doesn't have to transmit anything - just listen. ..then we could get the Tesco Finder app to work out where it thinks it is on the map. 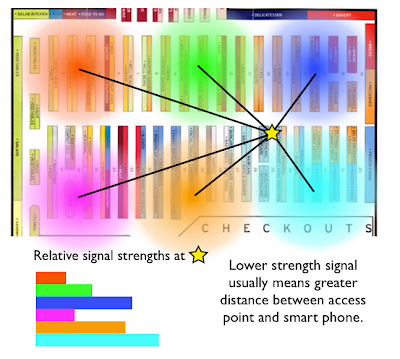 I have colour-coded 6 access points so you can see how the phone might work out where it is in the store. 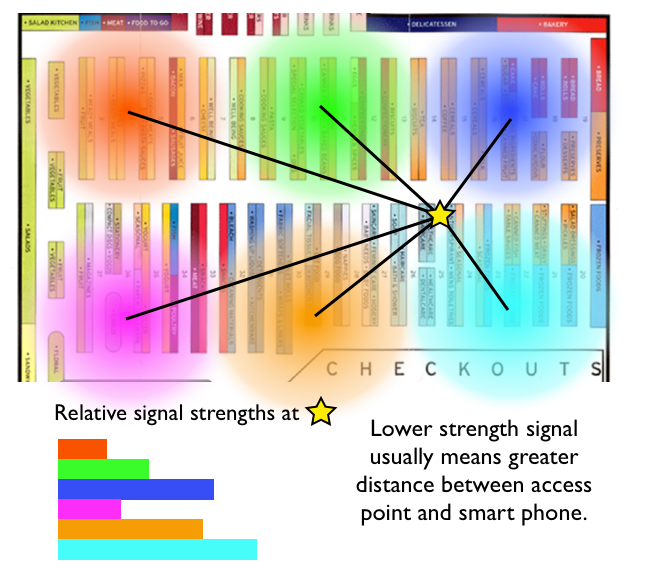 Given that the lower signal strength is most likely to mean a more distant access point, and because the phone knows where all the access points are located, it can work out where it is. Job done? Not quite... radio waves are a finicky phenomenon (I should know as I am a licensed radio amateur). From a radio point of view, Tesco sells a diabolic mix of products that reflect, refract and absorb signals. As the phone moves around, these three corrupters of signal purity will be in full force wrecking the ability of the app to work out where it is. For example, walk down the aisle full of bottled waters and it is quite possible that nearer access points will become weaker than more distant ones as these stronger signals are absorbed more by the water. Walk down the baked bean aisle and those tins are reflecting signal like you wouldn't believe. These rarely affect the staff equipment since the system allows staff devices to roam quickly between access points. It's only us who needs to know about each particular access point. So now you know why this an R&D project. Tesco Finder needs to work out (probably through some sort of averaging) where it thinks it is in a way that is quick and accurate enough to be credible to the customer. If we crack this, it means that we can provide in-store "satnav" style help with zero change in the infrastructure. We're going to have a damn good go! P.S. Once again can I point out to journalists that I am Head of R&D for Tesco.com (which just so happens to that part of Tesco pushing apps out in an R&D context). I am not Head of R&D for Tesco. Somebody else is! The BBC's Technology Correspondent, Rory Cellan-Jones, has written a nice blog article on the Tesco Groceries app now we have updated it to include barcode scanning. It's always good when people I respect are enjoying the fruits of the work coming out of Tesco.com! I've joined up with my colleagues in the Tesco Electricals team to launch a nationwide experiment to transmit personal messages and useful content straight to your Freeview set-top box over the UK's digital TV broadcast network. I'm looking for volunteers to help me with the experiment - and for a lucky 20 of you I'll provide the set-top box equipment you need - and which you can keep - for free! The objective of the experiment is to bring Tesco to your living room so that you can see content and 'do useful Tesco things' while you watch TV. I'll expand on that notion shortly. Tesco.com R&D has been given access to a 32kbps digital stream being broadcast from all main service transmitters listed on this web page link, and my first objective is to send individual messages direct to you on your set-top box. Now don't be confused here - most Freeview set-top boxes can see a "Channel Zero" on channel 306 (multiplex C) but most set-top boxes can't pick up (or indeed understand) the information contained in it. The above boxes can read the content of this channel - it's this channel I have been given access as a conduit to delivering content. Provide a web page where both we and you can send messages to your own set-top box. This proves that we can identify and broadcast messages to individual boxes. Create content that will sit on your set-top box which allows you (for example) easy access to product offers and "what's new" in such a way that you can add products straight to your Tesco.com online basket. This will require your set-top box to be plugged into the internet via your router, and for us to find a simple way for you to "join up" your grocery account with your set-top box's unique serial number so you don't have to login each time. Build on (2) to provide you with your own personalised details such as your online grocery favourites list so again you can add products straight to your basket. Ultimately, my objective is to see if I can implement a vision of adding products straight to your grocery basket as soon as you are inspired to do so when watching TV without disturbing your viewing. Examples of inspiration might be a commercial, or your favourite cookery show. I can imagine getting marketing to sponsor a cookery show and allow compatible set-top box (or TV) users to get the ingredients listed on the screen at the push of a button and they use the remote control to quickly add one or more of them to their online grocery basket without getting in the way of the watching the show. Importantly, this would work whether the show is being watched live or played back via PVR (on future PVR-enabled boxes). But hey let's prove the technical R&D point before we get too carried away. You shop with Tesco Groceries online (or via mobile) regularly - at least once a month. You get a good quality TV signal (whether digital or analogue) from a main TV transmitter and NOT a relay. You'll have to convince me of this so you'll need to investigate! If you already have Freeview then check that you pick up channels Dave, E4+1, and Price Drop TV (all of which broadcast via Multiplex C along with Channel Zero) without any problems. There are plenty of resources on the internet including a postcode checker at http://www.freeview.co.uk/ to help you find out. Also observe the direction your aerial is pointing and look at Google maps or Bing maps to see if it is genuinely pointing to a main transmitter. 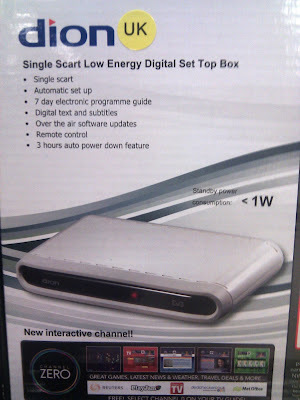 You have to accept that if you are not getting a decent signal from a main transmitter then it would be unfair for me to send you a set-top box. A way of connecting the set-top box to your router and thus to the internet. I know - us geeks don't mind trailing ethernet cables everywhere but most of us have partners who regard dangling ethernet cables as 'unsightly'. If you can't get yourself a powerline adapter or wifi games adapter (that allows games consoles to be connected to the internet wirelessly), and your negotiations with your partner regarding cables fails, then alas my free box can't come your way. Finally some commitment to try this service out at my request on a regular basis. Your box will receive special updates from the transmitter and I'll need you to spend a small amount of time trying out the updates according to my instructions. Don't worry it'll only take a few minutes each time, after which an email to me about what happened is all I need. Ideally I want each of the free set-top boxes I provide to be used to pick up signals from different transmitters, although this is not an overriding concern as Multiplex C (on which Channel Zero is broadcast) is being transmitted equally nationwide (including Scotland, Wales and Northern Ireland transmitters). 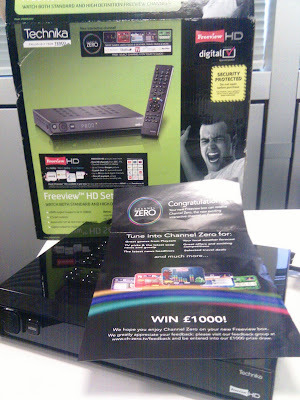 So if you'd like to take part in my Tesco Freeview experiment - with your own compatible box or a chance of obtaining one from me - go to the top of this article and follow the link. Don't forget to check out which transmitter you get your TV signals from, and how you might connect your box's ethernet socket to your router! Our Tesco Groceries for iPhone app has been updated to enable you to scan barcodes using the iPhone's camera (the same way that Tesco Finder for iPhone does). Now you can scan any EAN barcode and, as long as the product is sold in your home store, you can see the product's details and add it straight to your current shopping basket. This should really add to the convenience of grocery home shopping, so enjoy this new facility. To update the app, just launch App Store on your iPhone or iTunes on your computer and follow the easy instructions to download the free update. If you're now convinced to download Tesco Groceries for iPhone for the first time, click here to get the app. Jack Bennie, IT manager and colleague here at Tesco.com, has just alerted me to the fact that Tesco Online has just been voted the most accessible website for visually impaired computer users by members of RNIB and listeners of Insight Radio, the RNIB's online radio station for blind and partially sighted people in the UK. Jack's team have engineered much of the technology to make this work and he wanted me to particularly credit Zara Hughes, Sweta Subramanian and Sarah Bruce for the huge effort to bring a great grocery home shopping experience for customers who cannot see. This is a humbling achievement, mostly because grocery shopping is often the final barrier to full independence for people with sight loss. Imagine trying to go grocery shopping with your eyes closed and finding all the tins, packets and boxes feel the same, with no clue as to what they contain. Internet grocery shopping is the ideal answer, and I'm glad visually-impaired customers have such passionate champions here at Tesco.com that they have voted us to be the most accessible site. Text COOK and two or three key ingredients to 83726 (TESCO on your keypad) and get back a great recipe from Tesco Real Food. Texts are free for Tesco Mobile customers, other network customers may be charged at their standard network rate. With our focus on Tesco apps for the latest generation of mobile smart phones you might be given to wondering if we've forgotten customers with ordinary mobile phones with simpler internet access - phones which support a simple web browser but where 'apps' are beyond their capability. Steve McArdle hasn't forgotten. He works in our marketing team has alerted me to a new service we are launching for ALL customers with mobile phones using SMS text messages. Steve has been working with my colleague Lucia Del-Prete whose previous role at a mobile operator has given her tremendous insight into the enduring 'power' of SMS. Steve also worked with Tesco Mobile and their agency, InfoMedia (who did the technical legwork), to launch this service that will take your food ingredients and look up a great recipe for you. 1) Open your larder and fridge and observe a couple of key ingredients. 2) Type 'COOK' followed by two or three of the key ingredients you have observed. 3) Send the message to 83726 - that's "TESCO" spelt out on your phone's keyboard. The link took me to "Bubble and squeak potato cakes with bacon" complete with a picture that does indeed show baked beans and potato. Thanks to Steve and team for creating an "app" for more mobile customers, not just those whose phone has app capability. A hat tip to @MadMaxMel on Twitter who has just alerted me to the fact that this blog has been shortlisted for the Computer Weekly IT Blog Awards 2010. Individual IT professional male (blogs that detail an individual perspective, not a company line, of life in the IT industry. Any male blogger working in IT is eligible). It's fantastic to even have reached the shortlist - it's a credit to the great innovation undertaken across Tesco and Tesco.com that enables the content of this blog to be of such interest to people inside and outside of our organisation. I'd like you to meet another of our R&D team and introduce to you his pursuit of making searching for products on our website rather more interesting - indeed exciting to use - than it is right now. 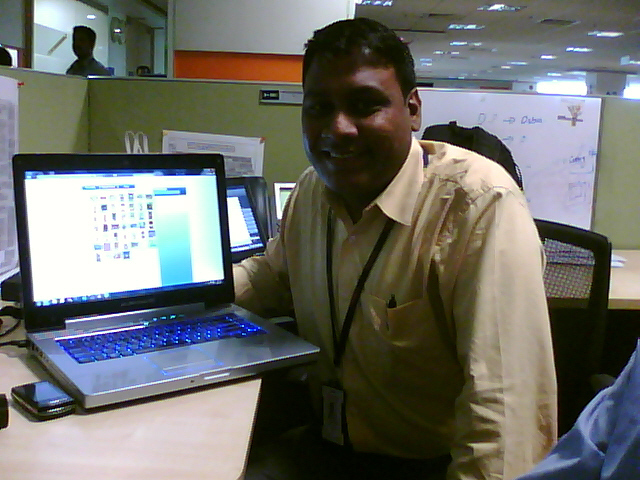 So here is Rakesh Ravuri. Say hello! 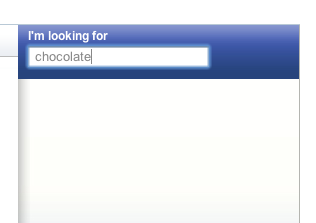 This proof of concept explores a new way of searching on Tesco.com. This is based on Microsoft's Seadragon and Deep Zoom technologies. The demo highlights a new way of searching using a series of linked data and demonstrates going from many things in a search, down to a few things using the filtering and being able to see clear patterns amongst that data. The demo uses Pivot's main feature "Collections", they combine large groups of similar items in product catalogue, so you can view the relationships between individual pieces of information in a new way. By visualizing hidden patterns, Pivot allows users to interact with thousands of pieces of data in a unique way with multiple page refreshes and minimum server round trips. When you have read these instructions, head to this web address: http://labs.techfortesco.com/superstore where you should see an outline of our grocery service and you appear to be logged in as Rakesh. Type in more search words in the box at the top left (above the filters) and note how products are being suggested to you (just the same as Google and Bing searches now offer suggestions as soon as you type in a character). Note how you can get to your wanted products with far fewer keystrokes than before. The interface is completely absorbing (indeed mildly additive) to use and you will soon find yourself adept at whirling through the various products searching and sorting filters. I showed this proof of concept a couple of weeks ago to a mesmerised audience at an IT showcase, some of who were wanting to grab hold of the mouse and try it themselves. 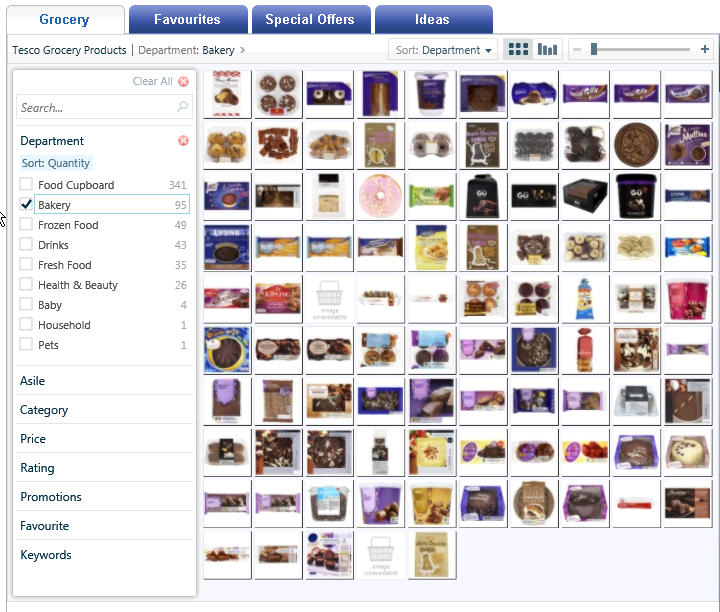 Rakesh's quest to make grocery searching more of an interactive visual feast has certainly worked, so go and try for yourself (it's running on a powerful but lone lab server so not too many of you all at once please). Just don't forget that this is proof of concept - R&D are here to excite the business and prove the point that this is all technically possible. Job done spectacularly well, Rakesh! Look out for Dragon's Den on BBC2 at 9pm this Sunday. It will feature Deborah Meaden who recently visited us to film Dragon's Den winner Carol Savage, founder of MyDish.co.uk, as part of a new partnership deal with Tesco.com. 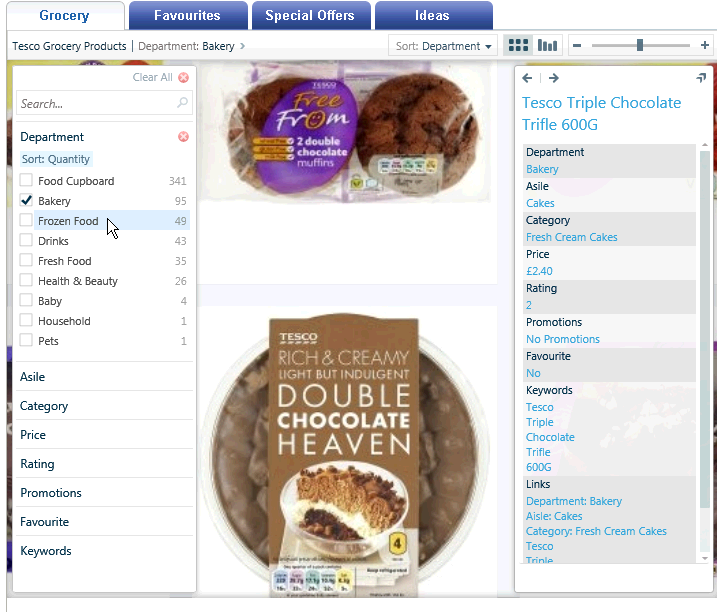 The MyDish website enables customers to upload and share their own recipes and the new deal means that MyDish users can now order all the ingredients they need in just a few clicks from Tesco.com. The MyDish team have used our very own grocery API to achieve the connection between their site and our grocery service. In addition, the MyDish technology is now included in our Real Food site so that customers can upload and share recipes, with the option to order the recipe ingredients from Tesco.com while they're online. You can check out customer recipes on Real Food by clicking here. The Daily Mail reporter Claire Coleman has written a nice write-up of our Tesco Groceries for iPhone app in her article "Think iPhone apps are just for geeky blokes? Read our Girls' Guide to making the most of your mobile.". If you want to shop from the bus and have dinner delivered to your door rather than struggling home with bagfuls of shopping, try a supermarket app. Tesco and Ocado both have ones that work in a similar way to their online shopping sites. You choose a delivery slot, pick the items you want delivered, and pay. For me, Tesco's has the edge as, if you have one of their loyalty cards, all previous purchases will be stored in the favourites section the first time you log on – saving you a trawl through the aisles. Justgiving have just emailed me to say that they have now closed the page of donations made for my reecnt 10K run in London. Techfortesco readers donated nearly half the money raised so thank you very much for your generosity alongside viewers of London Landscape TV who raised the other half (thank you all!). All the money you paid has now been sent to Albert Kennedy Trust so that they can continue to help with lesbian and gay youngsters rejected by their families because of their sexual orientation. Given the recent spate of suicides by gay teenagers in recent weeks, their work is needed more than ever. I'd like you to meet a couple of people - Sangeetha Rao and Rajiv Agarwal. Not heard their names before? Well that's about to change - indeed not only will you know them - you're about to trust them. After all, if you have a Windows Phone 7 mobile and you download our Tesco Groceries app onto it, it's their code you'll be running! Sangeetha and Rajiv are part of the Tesco.com Strategy and Innovation team based both at Tesco.com HQ in Welwyn Garden City, UK and in our development centre in Bangalore, India. It has been their considerable task to take Ribot's design and make it real on Windows Phone 7. They did everything: XAML, C# code, multi-threaded architecture, the lot. What's more they did it in record time to match Microsoft's unmovable launch deadline and they delivered code of such a high standard that it passed Microsoft's rigid phone testing procedures with flying colours. 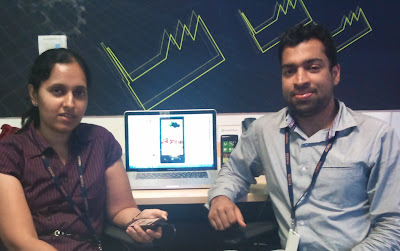 Sangeetha and Rajiv are graduates from India's exceptionally high quality university talent pool. Their thoughtfulness, intelligence, and passion to push the boundaries of innovation have really blown me away. I'm deeply proud that they have delivered such an exceptionally good app that Microsoft are saying that their phone can be aimed at Tesco shoppers. Their boss (and mine), Vishwa Kiran, Head of IT Strategy and Innovation, has been deeply impressed too. In an email to the team Vishwa said, "A successful mission for the Innovation team. Great effort all around. Thanks and congratulations !!". 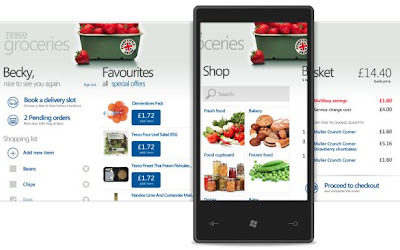 Ribot and our innovation team at Tesco.com have really done us proud in the design and development of Tesco Groceries for Windows Phone 7. It's an absolutely clean and fresh design, and you access its various elements by swiping your fingers left and right across the phone. (Incidentally 'Becky' is our very own Rebecca Pate who has helped project manage this application from the marketing and design perspective. A job well done I think!). 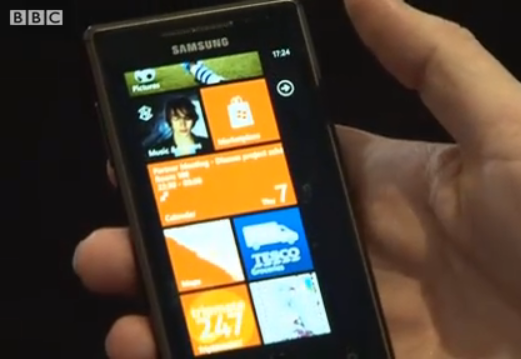 Great still from a BBC video of the Tesco Groceries logo sitting nicely in a square on a Windows 7 Phone. See the full video of the BBC's Rory Cellan-Jones interviewing Microsoft's Ashley Highfield here. Thanks to Twitter followers for pointing this video out to me! At short notice (I learned at 12:15pm today!) I am giving a speech and presentation as part of the Internet Retailing Conference at Novotel Hammersmith, London, tomorrow. I'll be replacing my CIO, JJ VanOosten who has had to pull out at short notice. Given that I wrote his presentation, JJ kindly suggested that I may as well go and present it myself! I'll be replacing JJ in this conference stream (link goes to conference stream page). on "How To Win In The Digital World of Retail". Yes well I think I know something about that! I'll be talking about how we have applied innovation in the digital world of retail to make the experience better for customers, simpler for staff and cheaper for Tesco. MBlox are hosting a mobile retail event at the Paramount Club on the 31st floor of Centre Point, Tottenham Court Road on 21st October. I'll be joining Orange, Firezza, Virgin Active and my good friends at the IMRG discussing innovation in mobile. Apps World conference is taking place at Kensington Olympia in London on 30th November - 1st December. I'll be covering mobile innovation in the keynote speech at 9:30am. It would be great to meet you at any of these events - you can learn from me and I can learn from you. Sounds like a deal? Yes we've made a Tesco Groceries app for Windows Phone 7! Designed by Ribot, built by our newly formed mobile development team (well done guys and girls). Watch the live webcast here - the Tesco app is part of the demo in this webcast. I'll update the link to archived footage showing the app when Microsoft make it available. As part of my fact-finding role I have received statistics that reveal the web browsers that customers are using to access the Tesco.com web site. The background for wanting to acquire this information was to discover what influence mobile browsers are having to the overall mix. As I uncover this more precise information (which I am keeping internal for the time being), I thought it would be good to share with you the more general trends. 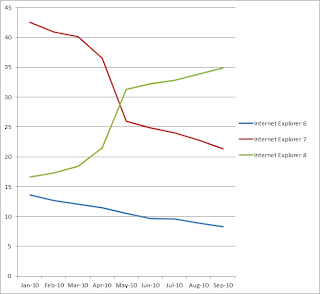 As you can see in the graph below (click graph to see larger version), Microsoft's Internet Explorer still dominates but its overall influence (across all IE versions) has declined from 72.7% to 65.6% between January and September 2010. 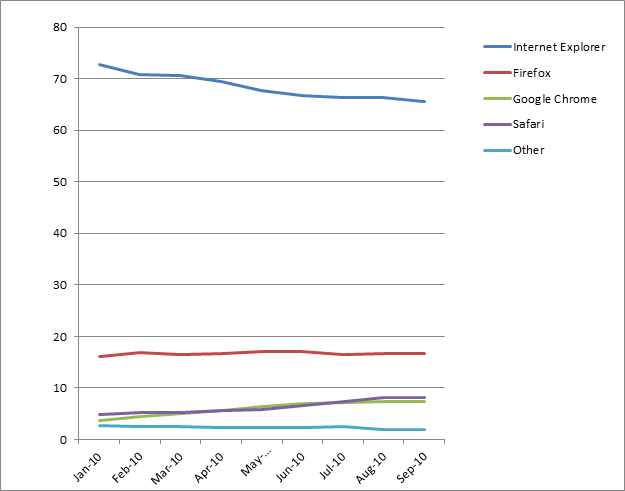 This reduction is taken up by the small but increasing influence of Safari from 4.8% in Jan 2010 to 8.1% in Sept 2010, and Google Chrome doubling from 3.7% to 7.4% in the same time period. 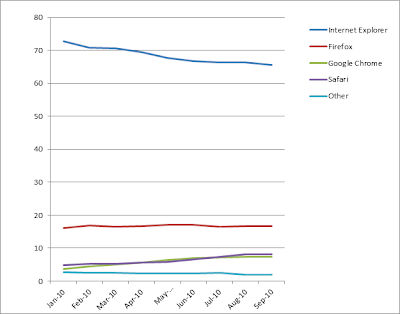 Firefox has hardly moved - from 16.1% to 16.6%. 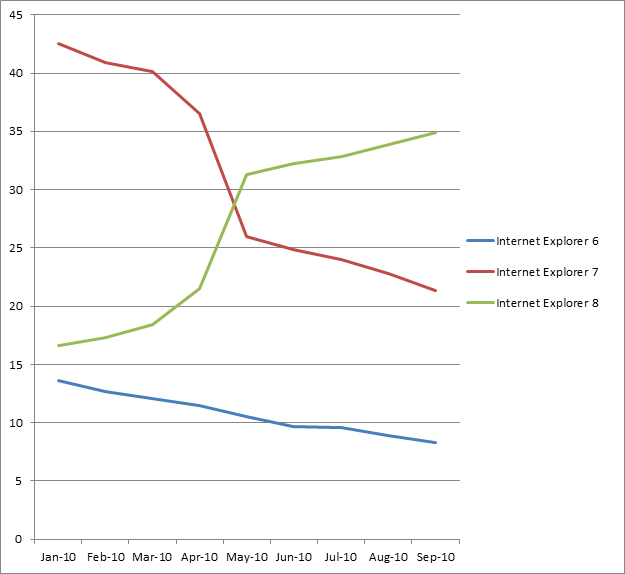 "Other" browsers have declined from 2.7% down to 1.9% although I am uncovering some evidence that a few such browsers masquerade as leading brands (indeed you can change a setting to select a suitable masquerade from IE to Firefox!). I guess this is happening to 'fool' web sites that check if a browser is valid for the functionality on their site. Thanks to Dave Merrilees from Tesco.com's IT user-interface team for sourcing this information for me.